So it’s been a little while since our last blog post because we’ve been staying closer to home. The first two weekends after our long Christmas trip were spent organizing and getting our lives sorted. Then we tried to go to Liverpool on the same weekend that the UK got hit by a snow storm. The 4 inches of snow on the ground meant that the motorways (i.e. highways) came to a complete standstill. We were trying to drive to Liverpool and after sitting in traffic for 3 hours, we had only made it 30 miles out of Derby. So we decided to reschedule our Liverpool trip and turned around to go back to Derby. Oddly enough, it only took us 30 minutes to get home. So anyway, last weekend we went to Budapest, which is the capital of Hungary. This was our first trip to a European country that did not use the Euro for its currency. Instead, they use the Hungarian forint, where 1 US Dollar = 214 Hungarian forints. So that made for some unusual looking prices, and we were constantly trying to do the math in our head so we could figure out how much stuff cost. We basically just estimated that 5000 forints was about 25 dollars, so 1000 forints was about 5 dollars, and tried to figure everything else out from there. So yes, there was a definite Eastern European feel to the city right from the get-go. We settled on buying just a one-ride ticket from the guy, and the transport pamphlet that we picked up said that any single ticket is good for all modes of transportation (bus, tram, metro, etc) for the entire length of the journey. So we figured that meant the single ticket would be good enough for us to get all the way to our hotel because that was the full length of our journey, even though we were taking 3 modes of transportation. It turns out that we were able to get all the way to our hotel, but we must have had some incredible luck. The only person who checked our ticket just happened to be on the bus, which happened to be our first mode of transportation in our journey. Nobody checked our ticket on the metro or the tram, which turned out to be a rare event throughout the weekend. On every other occasion throughout the weekend, there was always at least one person at the entrance to the metro checking our ticket, and often there were people spot checking throughout the journey. Somehow our tickets were only checked at the beginning, and it was lucky because we found out on our journey back to the airport that the single ticket is apparently not valid for the whole length of your journey. You have to get a separate ticket for each bus, tram, and metro that you go on. Of course, that’s not how we had read the pamphlet, so we had no idea. We just thought the one ticket would get us all the way to our hotel. And well, luckily, it did! So after successfully making it to our hotel, first up on the agenda was dinner! We made our way to Fülemüle étterem (no idea how to pronounce that) and proceeded to have an amazing 4 course dinner plus plenty of wine for about $50. Great deal for the amount and quality of the food we got. In fact, throughout the whole weekend, we felt like we got very good value for the money, especially when it came to food. 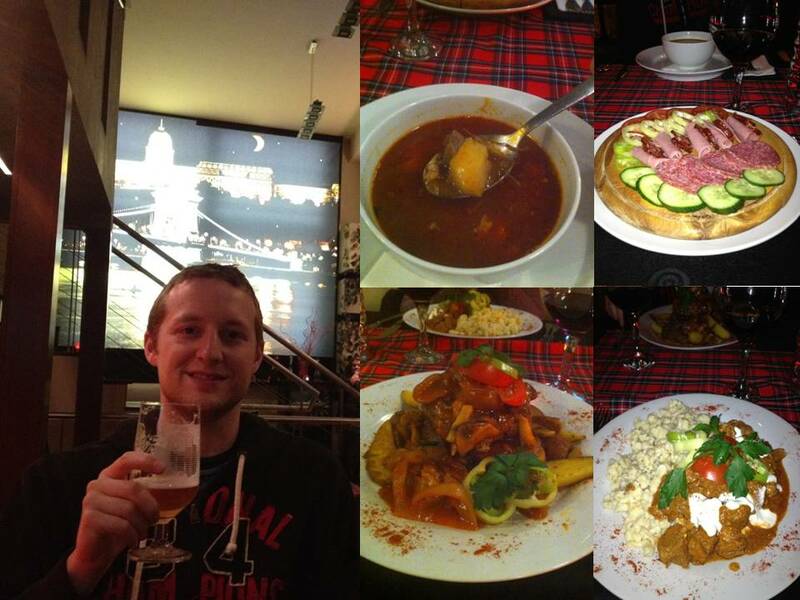 I really liked the Hungarian food in general. It was spicier than other European foods, and very heavy on the paprika, which I generally like. It also was very meaty, another plus in my book! First course was something called “palinka” which is a traditional Hungarian fruit brandy. I had apple and Doug had apricot, although we both tried each others. You could actually tell the difference between the two flavors, but it was really quite strong alcohol. For the second course Doug had a plate of all sorts of goose products: goose pate (liver), goose crackling (fried goose skin), and goose fat. I tried all of them and surprisingly the liver was quite good and I was the most skeptical about that. The goose fat was absolutely disgusting. Don’t get me wrong, I love cooking with goose fat, but it is just weird to take a bite of solid goose fat. Gross. My second course was some sort of onion and sausage dish that was really tasty. 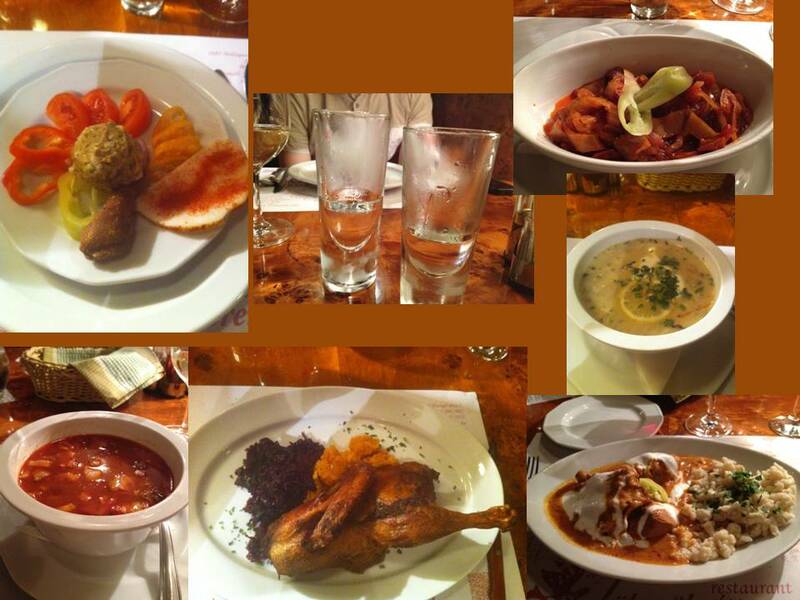 Then we both had soup: Doug’s was goose soup (yeah, more goose…) and mine was bean goulash. This was probably my least favorite course, but I’ve never been a huge fan of soup. Also, my soup had big chunks of really chewy pig fat that I just didn’t enjoy eating. By the time the last course came, we were already full! And the last course was a huge plate! Doug had half a duck on his plate, and I had a full plate of paprika chicken with gnocchi. It was delicious, but I left there uncomfortably full. We decided to walk off some of the fullness by exploring some of the city on foot. 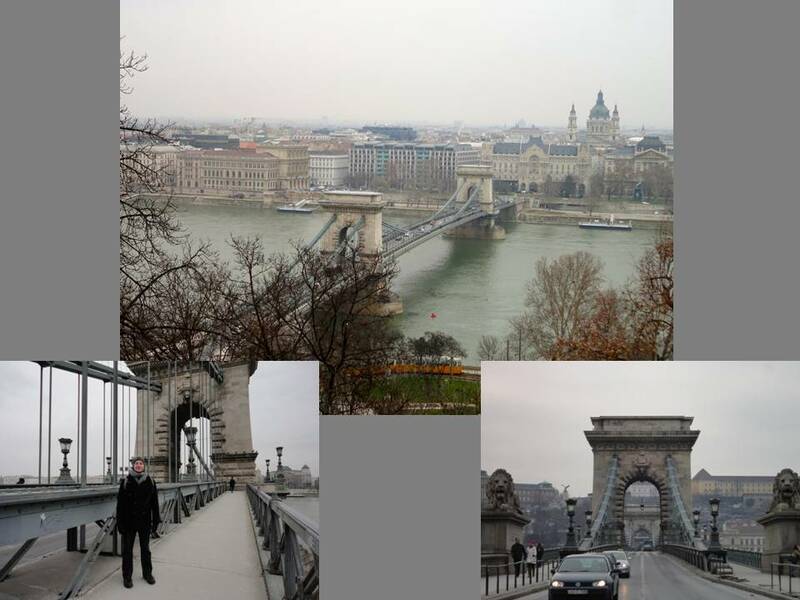 The Danube river runs right through Budapest, so we strolled along the river and went over one of the bridges. 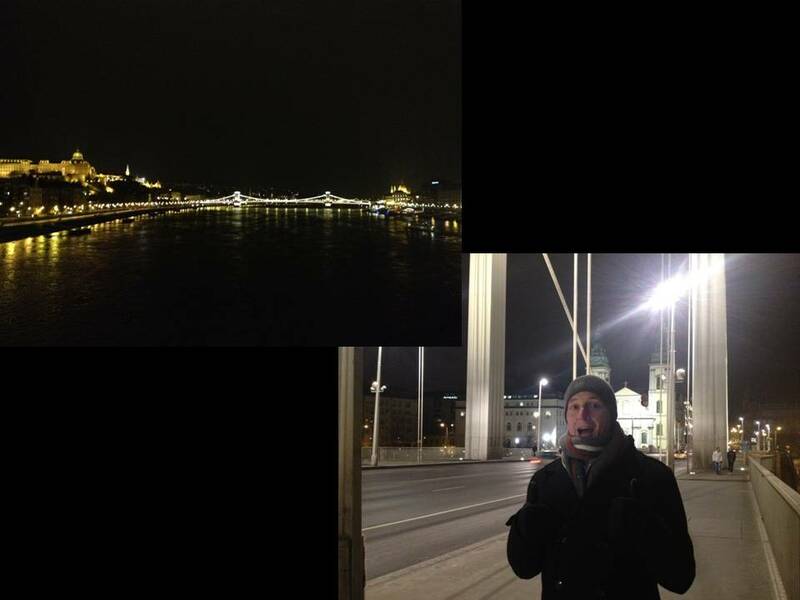 And let me tell you, January in Budapest is frigidly cold. We were all bundled up, but we were still freezing. From the middle of the bridge, we could see a bunch of boats docked on the side of the river. 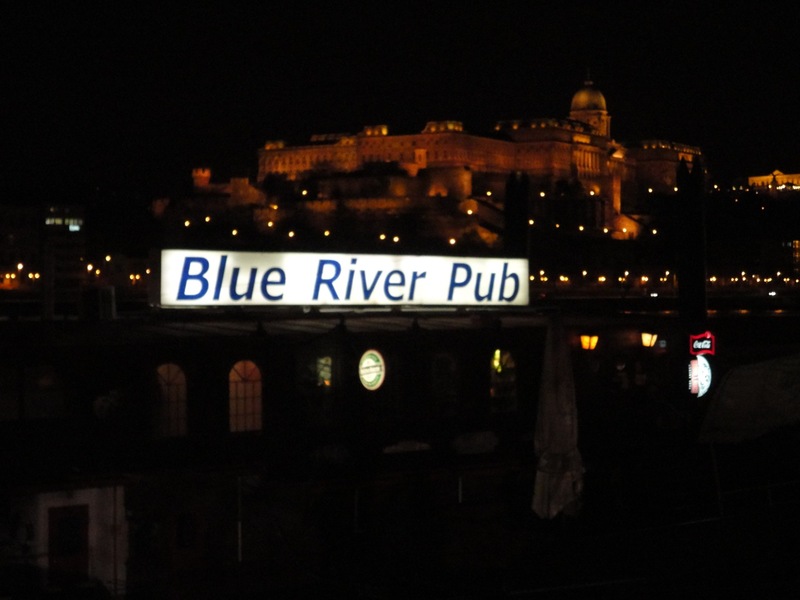 Our guide book had informed us that many of the best bars and pubs were actually on these river boats. We figured since we had been on almost every form of transportation that day (car, plane, bus, metro, tram), we needed to add boat to the list! 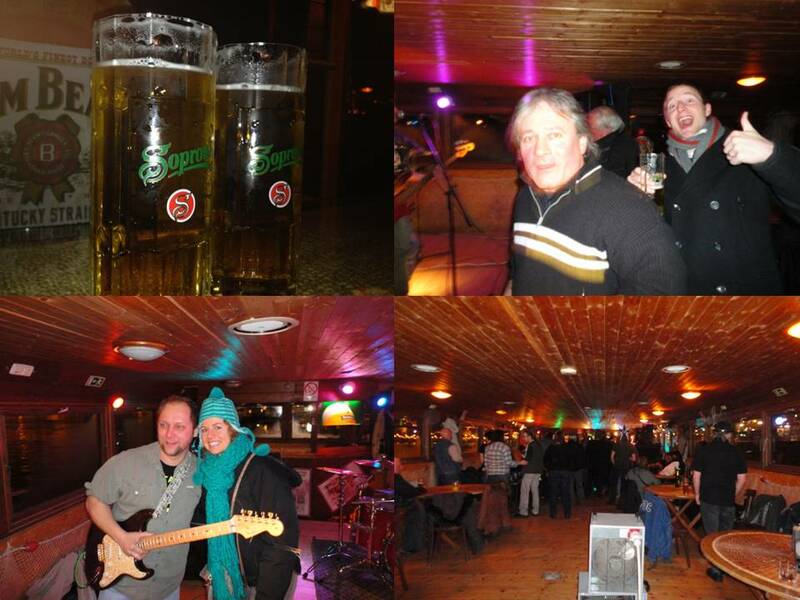 We walked over to the boats and decided on the Blue River Pub because we could see a band playing inside and also because the windows were fogging up which surely meant it was warm inside! Once we were inside, we realized we were truly hanging with the locals. In fact, I think we crashed someone’s costume party. There were people dressed as witches, bumble bees, and all sorts of other things. A lot of people had crazy hats and wigs on. However, everyone was really friendly. This one Hungarian man who obviously could not speak any English took a liking to us and kept pulling us up front by the stage. I think he knew one of the band members because he even pulled me up on stage to get a picture with his buddy. All of this happened without us being able to communicate. It turned out for an interesting evening. And the band was playing some sort of Hungarian rock ‘n roll, although we are almost certain it was a cover band because everybody on the boat was singing and dancing along. On Saturday, we first checked out some thermal baths. Budapest is known as the “City of Spas” because it has tons of natural hot springs. The minerals in the water are also said to be able to cure ailments. 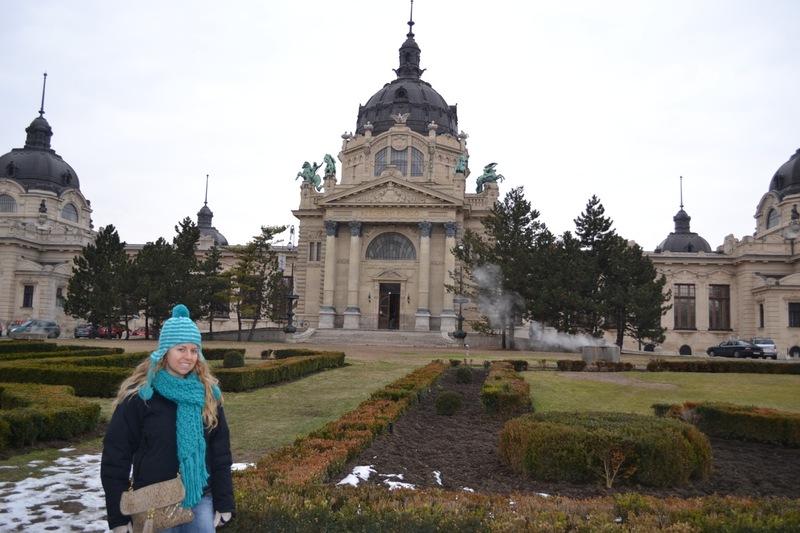 We went to one of the oldest thermal baths in the city, the Szechenyi baths. It was recommended in our guide book; however, the book failed us in not preparing us for what we needed to bring and the process once you get there (It was a Frommers guide book, not Rick Steves). We had simply brought our bathing suits, but apparently you needed to bring your own towel, flip flops, and bathing cap. We managed to rent some towels, so that wasn’t too big of an issue, and then we had to just go barefoot, which was a little gross. However, since we didn’t have bathing caps, that meant we couldn’t go in the outside pools. There were plenty of indoor pools, but it still would have been cool to check out the ones outside. Also, the process was definitely confusing. We paid for our day pass, but nobody told us where to go or what to do. There are these cabins that are like individual changing rooms, but we had gotten lockers, not cabins. So we had to wind our way through the cabins, and downstairs in order to find the locker rooms, and there were minimal signs in English. Once in the locker room, I had no idea how to choose a locker. Turns out that they were all taken! This one lady could tell I was confused and she spoke a little English, so she said that I could use her locker when she was done. As she was packing up to leave, I put my stuff in her locker, but I couldn’t figure out how to lock it. It turns out that the wrist band they had given us for our day pass has some chip in it that you put next to the locker to lock it. I would have never figured that out if it weren’t for the helpful lady! I also wouldn’t have figured out where the actual baths were because it was like a maze through the cabins to get there. But eventually we made it and then we got to relax in the various baths. There were varying degrees of temperature, and I’m pretty sure there were also varying degrees of minerals because some of the baths had a stronger sulfur smell than others. Overall, it was a good experience albeit confusing. 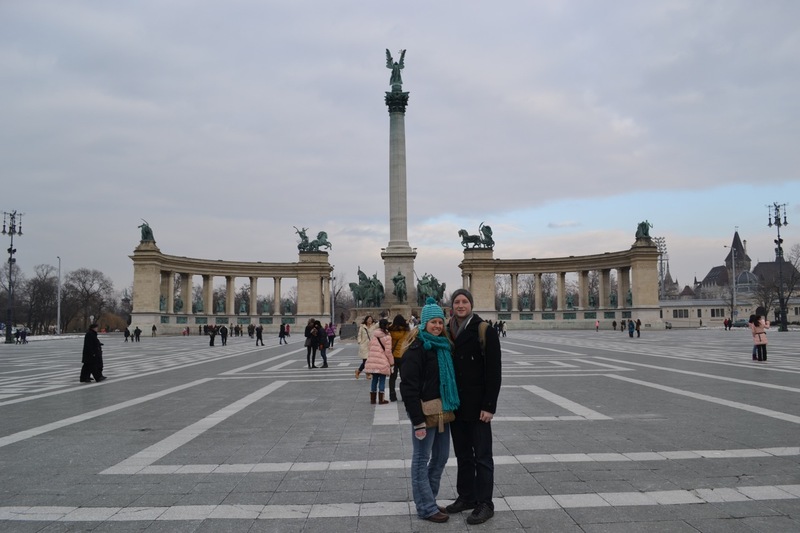 After relaxing in the baths, we walked down to Heroes square, which is one of the iconic symbols of Budapest. 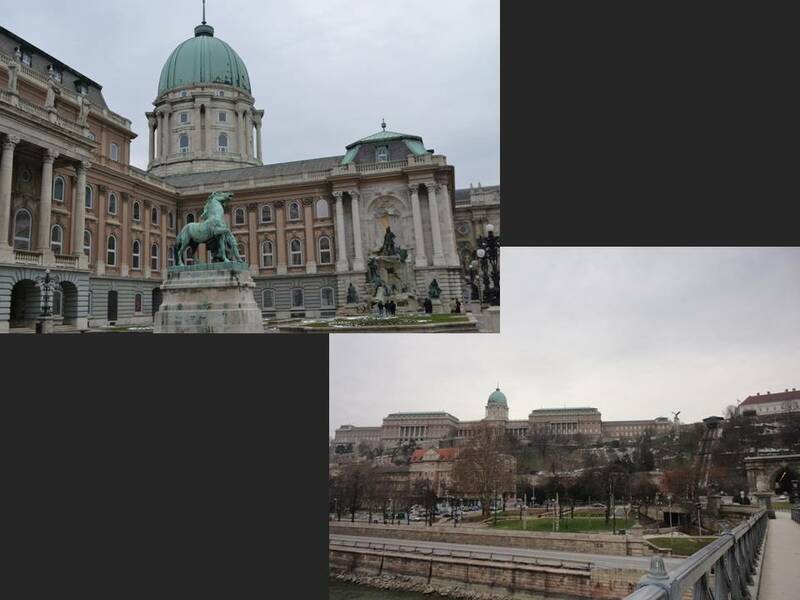 It has statues of the leaders of the 7 Magyar tribes, which are the tribes that founded Hungary in the 9th century. Oh by the way, the Romans had also been in Hungary way back in the 2nd century and were the ones that first set up the thermal baths (go figure… the Romans seemed to have set up baths all over the place!). We got on the nearby metro stop to go find lunch – which was coffee and cake. Our hotel served a pretty hearty breakfast, so we were content having coffee and cake for lunch both days and saving up for a big Hungarian dinner. 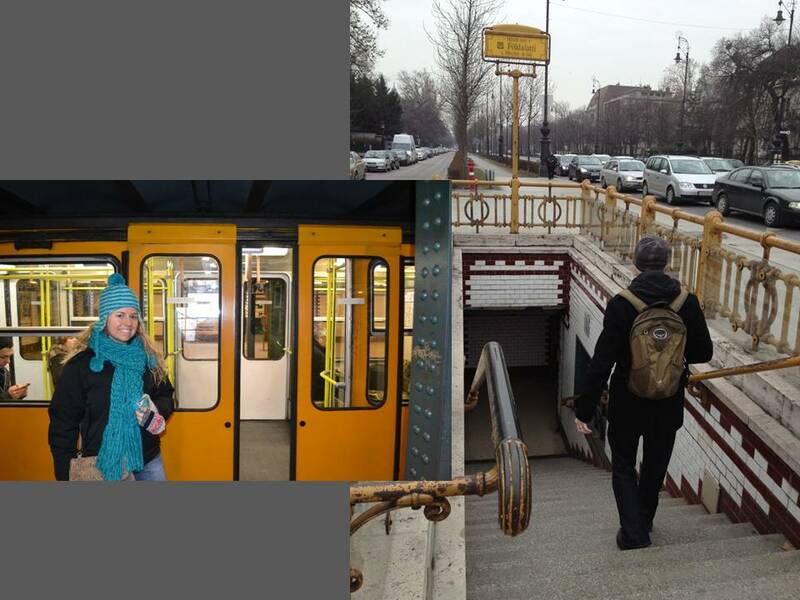 Budapest has the oldest metro on continental Europe. So yes, London’s metro is the oldest, but Budapest is next. And wow, you could really tell it was old. The cars felt like haven’t been updated since the 70s, although they seemed to get the job done just fine. 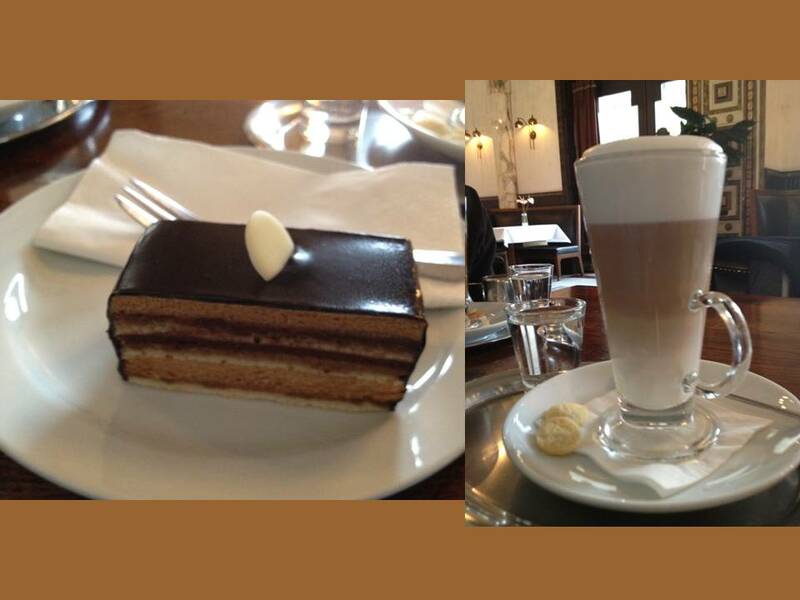 We ate our cake at the most amazing coffee shop. It was on the top floor of the book shop called Alexandra right on Andrassy Avenue between the Oktagon metro stop and the Opera metro stop. 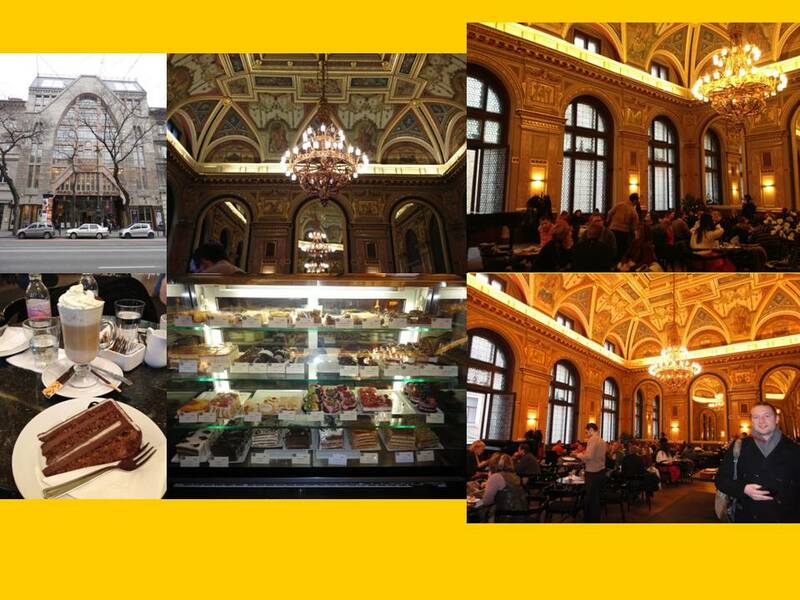 If you go to Budapest, you must stop there for some cake! Not only was the cake outstanding (I got the house specialty), but the atmosphere was just incredible. Huge beautiful chandeliers with high ornate ceilings. I absolutely loved it there, but Doug was not impressed by the slow service. Next we headed to the Opera house to check it out. We arrived there at 3:45 and it just so happened they were having a tour at 4pm, and they only have tours twice a day, so we figured it was meant to be and signed up for the tour. Also, after our Vienna opera experience, we figured we didn’t want to go to an Opera performance that night, so a tour would be a good way to explore the building. The tour was very informative, and I think we both enjoyed it more than we would have enjoyed an actual opera performance. They kept comparing the opera house to the one in Vienna, so that was pretty cool since we were just recently in the Vienna opera house. Since the Austrian Emperor Franz Joseph was ruling Hungary, he mandated that the Hungary opera house could not be as large as the Vienna one. Apparently he went to the very first performance in the Budapest opera house, but he never came back for another. Legend has it that he was upset that even though he had mandated the Budapest opera house could not be as large as the Vienna one, he had forgotten to say that it also could not be as grand. 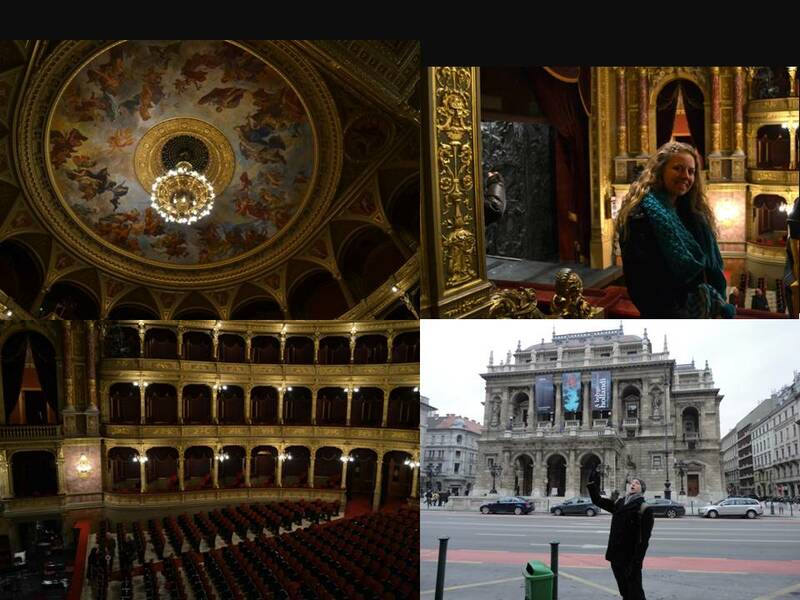 He was upset that the Budapest opera house was even more grand than his own Vienna one. His wife, Sissy, however, came back many times, and sat in her own royal box that we got to check out. We also checked out the St. Stephen’s Basilica. However, since Doug is sick of visiting churches, we didn’t actually go inside and tour the church. 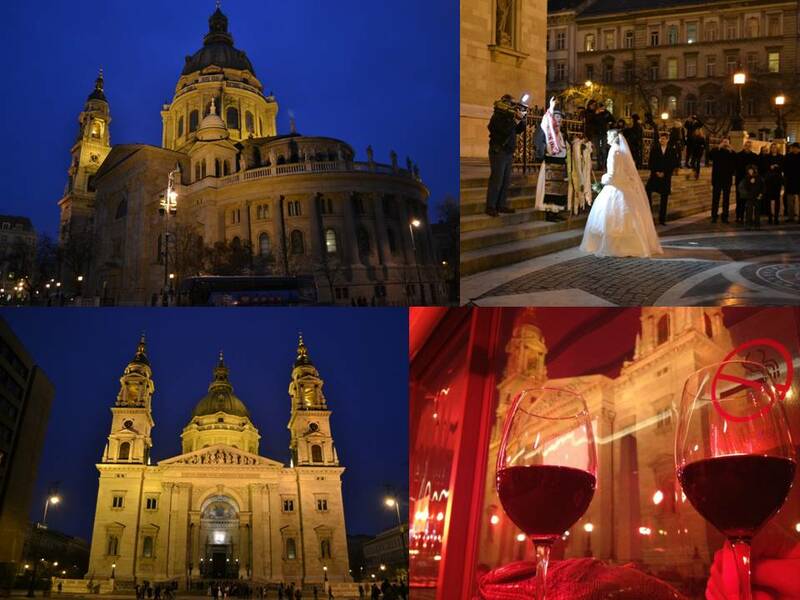 Instead, we drank some wine at a cafe across from the church and admired from there. There was also a wedding party taking pictures in front of the church, so I got excited about that! That evening we had another delicious Hungarian meal. It wasn’t quite as good as the first night, but we had some live music with a keyboard player and a singer, so that was pretty nice. Again, we were quite full from dinner. No longer “Hungary” in Budapest! Budapest has these semi-permanent (and semi-legal) bars and pubs called “kerts” that spring up in courtyards in the summertime. However, we were obviously not there in the summertime, so we couldn’t experience the full extent of them. 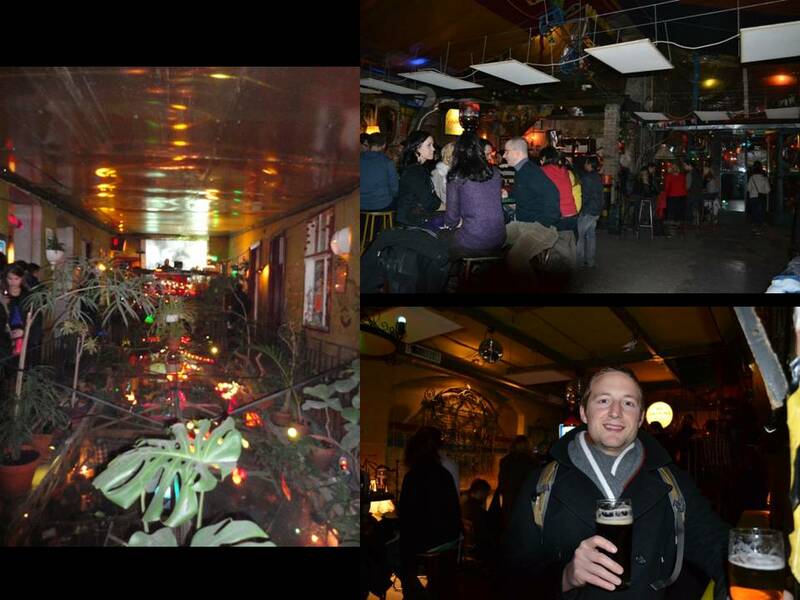 However, one of the biggest and most famous kerts, simply known as Szimpla Kert, is open in the wintertime, so that’s where we went. It was an interesting place; it basically seemed like an old abandoned warehouse that they had filled with junk and called a bar. Tons of little rooms and nooks and crannies – it would be easy to get lost in the place. It reminded me both of White Trash Fast Food – where we ate in Berlin, and also of the City Museum in St. Louis. On Sunday we explored the Castle district, which is on the other side of the river to where we were staying. 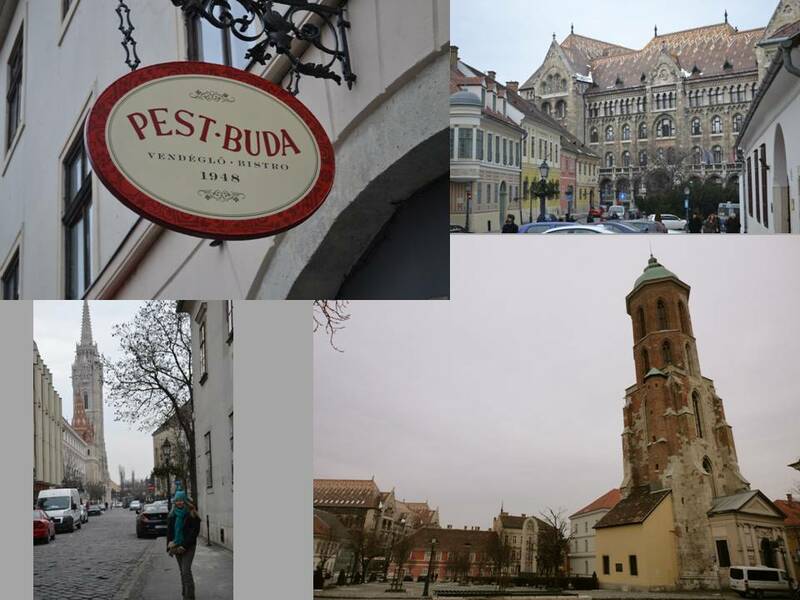 We were staying in the “Pest” side, and the castle is on the “Buda” side. There are tons of picturesque buildings and apparently this area is swarming with tourists – during the summer months. It was a nice view to the town and good to walk around, but it would have been a lot more pleasant in some warmer weather. We also didn’t explore inside the castle because of the same reason we didn’t go inside the church the day before. 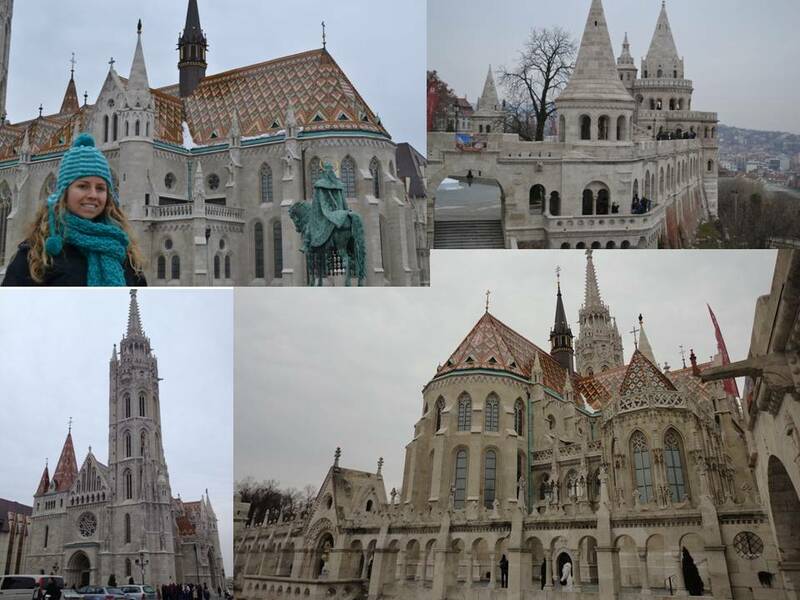 We didn’t go inside Matthias church, but I loved the roof on it! The tiling was gorgeous! The Fishermen’s Bastion are these 7 fairy-tale looking towers, again representing the 7 Magyar tribes that founded Hungary. 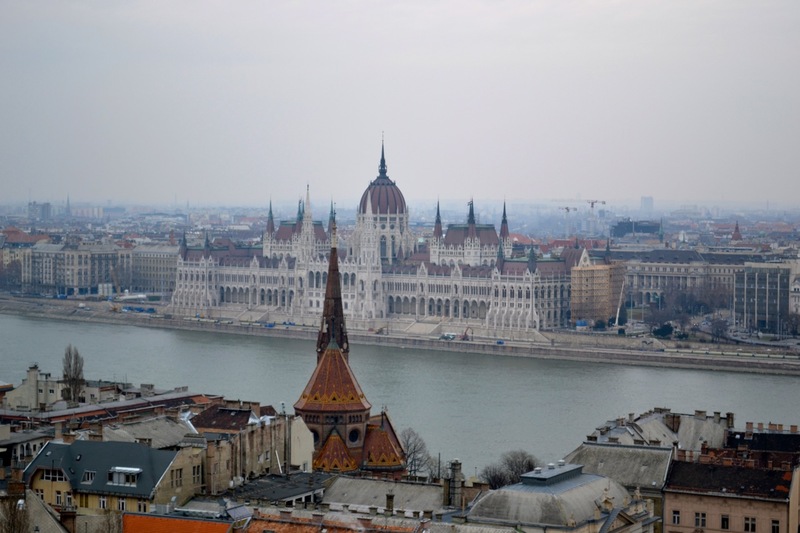 The towers gave a great view onto the city, the river, and the Hungarian Parliament building. After exploring the Castle hill, we made our way across the famous Chain Bridge and searched for some more coffee and cake. The Chain Bridge was the first permanent bridge across the Danube in Budapest. Lunch of cake and coffee! After getting a sugar and caffeine rush, we headed to the Terror House, which is a museum situated in the building that was once occupied by the Nazis, and then by the Soviets. The Terror House is now a museum and memorial dedicated to those that suffered under those regimes. The museum was actually really interesting and I’m glad that we went there. I had some vague knowledge that Hungary had been occupied by the German Nazis during WWII, but I didn’t know the full history. 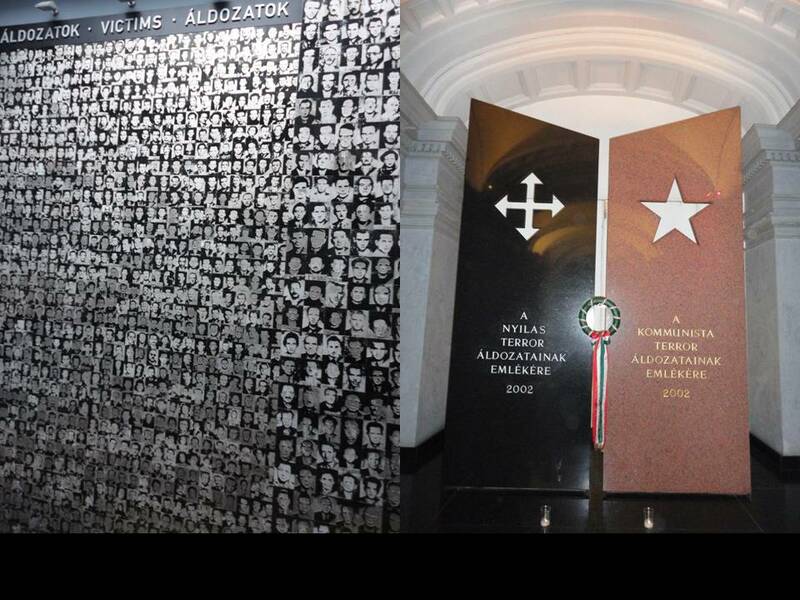 The museum had really good exhibits that showed the personal stories of the Hungarian people. A lot of the stuff was only in Hungarian, but in almost every room, you could pick up a sheet of paper that explained everything to you in English. By the end of the museum, I had read so many sheets of paper that I think I read a small book! But basically I learned about the horrible oppression that the Hungarians suffered. When the Nazis came to power, the Hungarians suffered much like the rest of Europe. However, when the Soviets pushed the Nazis out, it didn’t really mean freedom for the Hungarians. Although something like 80% of Hungarians wanted democracy, the controlling Soviets rigged the election and put the Communist party in power. Any Hungarians that were seen as a threat were shipped off to labor camps, and the public lived in constant fear and terror. The Terror House even contained torture chambers in the basement that we were able to walk through and it gave me the chills. Basically, Hungary was under Communist rule all the way until 1990. It’s crazy to think how recent that is! And that just about sums up our trip to Budapest. To make our way to the airport, we bought the single-ticket, like I said earlier, thinking that we could make it all the way because that was the whole length of our journey. However, after our tram ride, we were going to get on the metro, and they checked our ticket there. That’s when we found out that we had to buy separate tickets for each leg of the journey – tram, metro, and bus. Whoops. Oh well, guess we’ll know for next time – or you know it now in case you visit there yourself. Thanks for reading the blog post – a decently long one. I experimented with making collages instead of inserting tons of individual pictures, so let me know if you prefer that or not. I think it may have taken a little longer, but I like having the pictures grouped together. Our next big trip will be to Belgium in 2 weeks, so look forward to that one. Enjoy the Super Bowl tonight, but don’t tell me the result because I won’t be able to watch it until after work tomorrow. Wonder if I can last that long without hearing the outcome.